Say you want a car and you want a motorcycle, but you can only get one because Reasons. So what do you do? 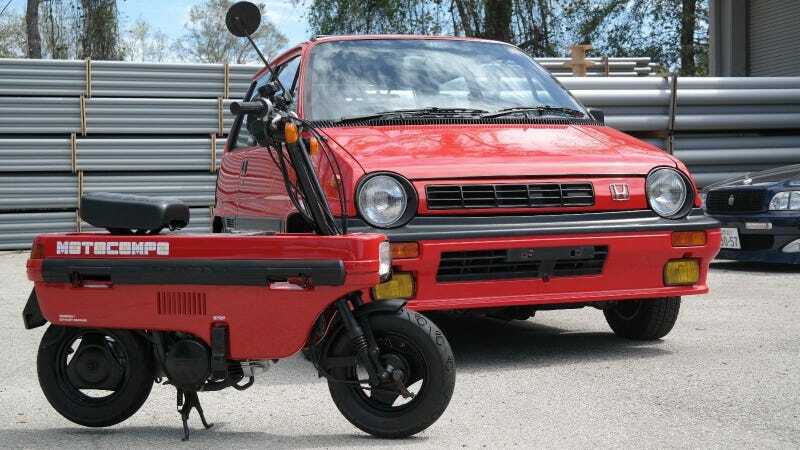 At first, you think you’re stuck, but then you realize that you are not, because you could just buy this 1985 Honda City R and Motocompo, in which you get both a car and a bike. If you have been on the lookout for one of these magical machines, consider your search over, because there’s a pristine example for sale on eBay that’ll set you back only about $15,000. Only. This red Honda City R is in tip-top shape with a 1.2-liter inline four-cylinder engine. It has 34,000 miles on the clock and is right-hand drive. It rides on new tires and a set of OEM factory Enkei wheels. Somehow, it can seat four and carry around a little fold-able, 50cc pocket scooter in its trunk. This little scooter, called the Motocompo, has folding handlebars and is about the size of a suitcase. The seller claims that it weighs about 45 pounds. It is goddamn adorable. Yes, $15,000 is a bit high. But think about it this way: You’re knocking out two birds with one stone and getting two vehicles for the price of one.